(Nanowerk News) The planets and moons of our solar system are continuously being bombarded by particles hurled away from the sun. On Earth this has hardly any effect, apart from the fascinating northern lights, because the dense atmosphere and the magnetic field of the Earth protect us from these solar wind particles. But on the Moon or on Mercury things are different: There, the uppermost layer of rock is gradually eroded by the impact of sun particles. New results of the TU Wien now show that previous models of this process are incomplete. The effects of solar wind bombardment are in some cases much more drastic than previously thought. 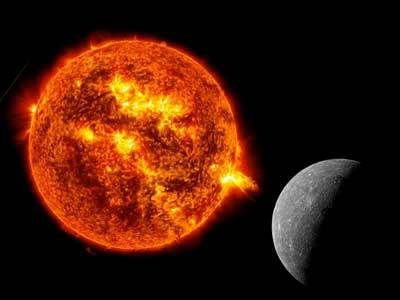 These findings are important for the ESA mission BepiColombo, Europe's first Mercury mission. The results have now been published in the planetology journal Icarus ("Solar Wind Sputtering of Wollastonite as a Lunar Analogue Material – Comparisons between Experiments and Simulation"). "The solar wind consists of charged particles - mainly hydrogen and helium ions, but heavier atoms up to iron also play a role," explains Prof. Friedrich Aumayr from the Institute of Applied Physics at TU Wien. These particles hit the surface rocks at a speed of 400 to 800 km per second and the impact can eject numerous other atoms. These particles can rise high before they fall back to the surface, creating an "exosphere" around the Moon or Mercury - an extremely thin atmosphere of atoms sputtered from the surface rocks by solar wind bombardment. This exosphere is of great interest for space research because its composition allows scientists to deduce the chemical composition of the rock surface - and it is much easier to analyse the exosphere than to land a spacecraft on the surface. In October 2018, ESA will send the BepiColombo probe to Mercury, which is to obtain information about the geological and chemical properties of Mercury from the composition of the exosphere. However, this requires a precise understanding of the effects of the solar wind on the rock surfaces, and this is precisely where decisive gaps in knowledge still exist. Therefore, the TU Wien investigated the effect of ion bombardment on wollastonite, a typical moon rock. "Up to now it was assumed that the kinetic energy of the fast particles is primarily responsible for atomization of the rock surface," says Paul Szabo, PhD student in Friedrich Aumayr's team and first author of the current publication. "But this is only half the truth: we were able to show that the high electrical charge of the particles plays a decisive role. It is the reason that the particles on the surface can do much more damage than previously thought." When the particles of the solar wind are multiply charged, i.e. when they lack several electrons, they carry a large amount of energy which is released in a flash on impact. "If this is not taken into account, the effects of the solar wind on various rocks are misjudged," says Paul Szabo. Therefore, it is not possible to draw exact conclusions about the surface rocks with an incorrect model from the composition of the exosphere.